1. Both Republican candidates and President Obama are enamored of charter schools—that is, schools that are privately managed and deregulated. Are you aware that studies consistently show that charter schools don’t get better results than regular public schools? Are you aware that studies show that, like any deregulated sector, some charter schools get high test scores, many more get low scores, but most are no different from regular public schools? Do you recognize the danger in handing public schools and public monies over to private entities with weak oversight? Didn’t we learn some lessons from the stock collapse of 2008 about the risk of deregulation? 7. Although elected officials like to complain about our standing on international tests, did you know that students in the United States have never done well on those tests? Did you know that when the first international test was given in the mid-1960s, the United States came in 12th out of 12? Did you know that over the past half-century, our students have typically scored no better than average and often in the bottom quartile on international tests? Have you ever wondered how our nation developed the world’s most successful economy when we scored so poorly over the decades on those tests? 9. 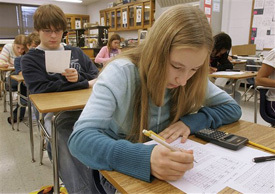 Did you know that family income is the single most reliable predictor of student test scores? Did you know that every testing program—the SAT, the ACT, the NAEP, state tests and international tests—shows the same tight correlation between family income and test scores? Affluence helps—children in affluent homes have educated parents, more books in the home, more vocabulary spoken around them, better medical care, more access to travel and libraries, more economic security—as compared to students who live in poverty, who are more likely to have poor medical care, poor nutrition, uneducated parents, more instability in their lives. Do you think these things matter? We need to put this in the hands of all of the pundits and interviewers of politicians. When they interview they never know the incisive questions to ask the politicians and legislators so they get out-talked. The interviewer ends by saying,"You are doing a great job," particularly when they interview Arne Duncan. He speaks so fast, even I, who consider myself pretty up on issues in education, am left dumbfounded. As Diane knows, some of us have been hammering on many of these points for quite some time, in my case by blogging and in face to face conversations with elected public officials and their staff. Despite that, making progress has been exceedingly difficult. and now even the teachers unions seem in danger of caving in on key issues in order to maintain a place at the table. One key problem has been the takeover of much of policy by a set of closely related organizations - Broad Foundation, Gates Foundation, Teach for America and its alumni (who are increasingly in key positions in Congressional offices, schools of education, and state departments of education). It has also been exceedingly difficult to get the main stream media to properly cover education - too often they write glowingly and uncritically about charter schools, voucher programs, merit pay, because those writing about education lack the training and understanding to dig into things and properly explain to their readers. We have been fortunate to have voices like Diane Ravitch and Linda Darling-Hammond, yet even they, and they other scholars on the policy brief put out by EPI seem to get ignored, while the pronouncements of Bill Gates - who seems to have little real understanding of education - get repeated over and over. Real educators are trying to reclaim our profession, but we have to do that on top of our real jobs, we do not get funding from billionaires who are pushing corporatization agendae. Thanks Diane. I will try to ensure the Congress Critters I know see this piece. Cannot promise it will make a difference, not given the direction of the Department of Education of this administration, which has done more damage to the future of public education in this nation in the past three years than the total done by all the Presidents from Reagan to the 2nd Bush. I am a high school teacher in New Jersey. I heard Ms. Ravitch speak at our convention this past November and I always wonder why the likes of John Legend and Oprah get more press for their ideas on improving education than she does. Perhaps it is that she speaks in full truths, which don't ring as loud or entertaining as half-truths. I also wanted to point out one question that is seldom discussed - out of the top-performing nations mentioned here like Finland, Japan and Korea - how many of those have to deal with multiple cultural differences, ethnic backgrounds and language barriers? A case can be made that the tradeoff for our freedoms and for our position as the immigration capital of the world is that maybe we don't score at the highest levels of academic evaluation - but maybe we don't WANT to. Perhaps it is just better that we accept students of all languages, ethnic backgrounds, religions, and economic levels. To the politicians looking for a cause to rally around, students and test scores are numbers to be argued and tossed about randomly. To us teachers, they are just kids. We don't care about where they came from - we only care about where they are going. This is NOT the case in these other closed-loop societies. I've recently co-founded an advocacy group called the Design-ed coalition whose goal it is to provide K-12 teachers with information to infuse their lessons with design education. No new policies, no new radical changes - just tools and information to help them teach better. If everyone involved in policy just did that, we'd be a lot better off. Great questions, great focus, and very important! Thank you, Diane, for your thoughtful expressions here. I read a parallel article tonight hypothesizing on what reactions would be if Medical Doctors were subjected to the same criticism and expectations as Educators are ... it all came down to the supposed response that "my patients don't eat well, are poor, etc. etc. Excellent piece, with one caveat: Not all charter schools are private. In fact, in New Mexico, all charter schools are public schools subject to the same standards and oversight as "regular" public schools. For example, they must enroll any student who applies, subject to a lottery if applicants exceed places. Wow, I have read articles stating the exact opposite.Diane might have some bias in her article considering that she works as a professor of education? You just showed why not to listen to research. It doesn't help. Briefly, I was excited to read this piece. Indeed it addresses lots of problems with various efforts to reform education. I agreed with everything. After I got to the end, though, it seemed that the take-away message was that our schools are fine ("world’s most successful economy"). The only way to make kids do well in school is see that they come from wealthy families. The piece basically attacks every possible way to make schools better and says that they don't work. I hadn't intended to hit submit. I earned a Ph.D. in education from Vanderbilt. I agree with Ravitch's points, but here's how a politician might interpret what she wrote. 1. Don't try to innovate. Schools are fine as they are. 2. Don't try to use economics to improve or attract better teachers. Don't pay them more. It won't help. 3. Don't try to empower students or parents to go to better schools. 4. Don't try to use the tools that everyone outside of uses to learn and be successful. 5. Don't let good students go to the best schools where they can excel (unless they are able to afford to pay for private schools). 6. Don't try to use an objective measure to value teacher effectiveness. We have no accurate or stable way to know whether students are learning anything. 7. Don't worry that our students appear to compare badly to their international peers. We have world’s most successful economy. Schools don't really seem to matter. 8. We have lots of poor kids, but kids who aren't poor are getting great educations. 9. Don't waste money trying to educate the poor. Only people with money can do well in school anyway. 10. It doesn't matter if kids don't learn in schools. We need schools to hold communities together; that's what is important. 11. Don't fire teachers who appear not to be effective. If we create a culture where ineffective teachers cannot expect to keep their jobs, no one will want to become a teacher. 12. Politicians don't pay attention to research and studies because educational research provides no tools for improving education. You have made the case that if you care about improving schools, educational research is not the tool for it. I'm moving to the beach. You have hit the problem directly. Politicians need to get out of the business of deciding curriculum etc. and worry about funding. That is their job. That is why we have education professionals. What they do is comparable to telling the heart surgeon how to perform open heart surgery. The only difference between the heart surgeon and a teacher is that, when the surgeon looses a patient, that person's pain is over. When a teacher looses a child, that child's pain is just beginning. Too many children are being lost to political interference. BTW - While comparing test scores with other nations, does your research calculate in the fact that those same nations only test the top 1/3 of their students? Hence, for example, in Japan there is no illiteracy. But the Japanese do have the highest suicide rate among their children of any of the nations you mentioned. Diane Ravitch was head of research in the Department of Education. During her tenure, or after her replacement, the condition in American schools scarcely changed. New ideas and techniques were tried and discarded without any regard for their effectiveness. Ravitch is an excellent writer and historian, a champion in describing our education system. But were do we go from there? of teachers. Admit that you cannot spread charisma and effectiveness on a mass basis. What then is to be done? Mass social work programs to promote parental involvement? Much too expensive, unfortunately. Computers? often disliked by teachers and not turning students on. I have been trying to think about a solution to motivate students rich and poor, something with a true mass appeal. A possibly, but probably, imperfect solutions may be specially designed computer games which require players to master some skills to allow them to progress. Or possibly some cash reward systems for students showing some progress? courage to mix the major share of excitement for players of these games with well disguised learning goals. Beware of gifted proposal writing and the funding of the educational equivalent of Chinese backyard furnaces. (For old-timers: do remember Title III of ESEA). Professor Ravitch what would you think of mobilizing the creativity of game makers? Disney perhaps. Welcome, Donald Duck, the leader of deadly robots. Here' why merit pay doesn't work in education: if I come up with a great way to teach a concept, will I share it with you, the teacher across the hall? Not if my job and family's livelihood depend on my students doing better than yours...collaboration is out. The questions are, in the main, well formulated. Perhaps the best test case is in England, where the deep coverage in The Daily Telegraph over the past two months of the pathology of education (and the indirectly visible pathology of the political response) has gone largely unnoticed in America. The coverage in England has been equally parochial in that the sometimes useful education analysis in Boston and New York goes unrecognized. There is no world education reporter or columnist who tracks developments in at least the English speaking world, to begin with. If newspapers initiated a seven cities world education project for 2012, some progress could be made. (I suggest London, Boston, New York, Toronto, Vancouver, Sydney, and Melbourne). Murdoch is in a good position to show leadership, given the (under-performing) Higher Education section in The Australian, weekend Review in The WSJ, and the Sunday Times of London. Murdoch is also in a good position for comparative education reporting because he owns the best book for teaching English, the COBUILD English Grammar. What is striking about the journalism schools is that they remain unable to grasp what is going on with the English language. Long ago, these schools should have made the COBUILD English Grammar official for their operations. Instead, we have silly muttering about usage issues, at Poynter and at the CJR. Similarly, it is striking that word meaning often emerges as an issue in law, while neither judges nor journalists understand the corpus revolution in linguistics. Each journalism school should make a corpus dictionary official. I like the Oxford Advanced Learner's, but the Longman Dictionary of Contemporary English has an excellent CD. Perhaps the most under-reported story in the world is the nature of English as a virtual predatory corporation larger than Apple or Walmart in revenues. The Economist's so-called intelligence unit should have swarmed this story a decade ago. English operates as a cartel since the methods are astonishingly similar and inept. Why is TOEFL garbage as compared to tests that could be based on corpus tools? In Australia's Victoria, the Ombuds, based on absurd reasoning, recommended more IELTS testing. The Australian failed to cover this story. The British failed to realize that this story had implications for Cambridge University Press as a peddler of trash. In the US and Canada, the enormous sleep of the education reporters continued apace. Do academics in the US know anything about education? Why do they put up with the SAT and TOEFL? How is it possible that the state of Massachusetts could need a NCLB education waiver from the President? How can Harvard be diminishing the high school experience for students with its manifestly ridiculous admissions practices? How can product development be left in the hands of Janus-faced publishers? Why hasn't Harvard developed English French Fiction courses for determined high school students? If you search the fiction section in a good bookstore, you will notice the many great translations into English of Balzac, Hugo, Stendhal, Flaubert, and Proust. French departments may have a clumsy course with indifferent translations. Massachusetts English departments need to stimulate courses in English French Fiction for the schools as part of the admissions process. It would be effective to have 12 novels, including all six by Proust. Academics in Boston are too lazy to keep on top of bookstore sections and design the courses. If they were capable, they would have realized that routines in International Relations, in Model United Nations, are hopelessly obsolete. History, as its related subject English, is one of the most productive areas for live curricula, so that banks could buy the books students discovered in their weekly analysis of the History sections. The Cold War board game "Twilight Struggle" would also be valuable for learning English and History. Academics are frozen in their obsolete routines. That is why the linkage between schools and universities is so atrocious in Massachusetts. Reporters in America should set out to define the Janus-faced nature of education publishers. Pearson's "Cognition" by Mark Ashcraft is one of the very best books for study of English, in that the writing is so advanced (yet clear) that high school students can do the book. Pearson also has LDOCE, an exceptional corpus dictionary. Nonetheless, the worst offender in England's education crisis is Pearson's Edexcel. The New York Times has also reported on the depredations of Pearson. Pearson is also failing in product development. Norton has some good critical editions. Penguin should initiate a series, to begin with the new Freud's "Dora" and James's "The Turn of the Screw," texts and a comparative casebook in hysteria. Every paper should have full time education columnists. The NYT has the nonsensical Choice. I'm not an educator by profession (I'm an architect). While Professor Ravitch does not offer concrete solutions, two of her assertions point very clearly to economics and attendant poverty (along with the complication of diversity) as a major contributor to our so-called failing educational system. As the previous posters probably realize, the income disparity has only gotten worse over the last three decades, with middle class incomes remaining essentially flat, while the upper one percent is thriving and grabbing an ever larger share of private wealth. The lowest income Americans are the biggest losers. Since the 1950s, tax rates have fallen significantly. The necessity that American secondary education must teach all students, regardless of economic status, quality of home life, and native or immigrant status, translates to students who come to school unprepared to learn. A teacher in a low performing school may actually be a better educator than one in a high performing school. Until our elected politicians can abandon their winner take all attitudes and come together to begin to solve the economic problems of this country by adopting sane proposals such as those of the Simpson-Bowles Commission, our schools will not improve. Perhaps more emphasis on early childhood development, more assistance for low income working parents, and a general mind shift toward saving our children prior to reaching school age would be more effective than after the fact band aid ideas. Unfortunately, my confidence level in the ability of politicians to think out of the box and act like adults is almost nil. The last 26 years of my 32 years in the public school system were spent working individually with kindergarten through 12th-grade students in an attempt to advance their reading to grade level. That rarely, if ever, happened. Placing children at levels with no regard for their actual achievement dooms those who are placed over their heads and disillusions those who are unchallenged. Almost 30 years of unsuccessful reforms since “A Nation at Risk” should be proof enough that the structure of the current school system is designed for failure and needs to be replaced. The one spectacular goal of our education system must become the elevation of students’ reading comprehension to the college reading level. Leaving school with a college reading level makes available all the information contained in books as well as the loftiest of career options. There is no magic bullet to the target of improving education in this or any other country. Reduce poverty and learning amongst children will improve. Make certain that their teachers are educated and well trained in the activity of teaching. Test scores are the end result of the process and cannot legitimately be used to determine how to imitiate and carry on that process. I repeat, reducing posverty is first and foremost when looking for the antecendents to better learning. Oh, one more important factor, spend enough money on the educational process. Look at the best educational results and low and behold you find a well funded educational system. Thank you once again Dr. Ravitch. Important point-- the quality of the teacher is the number one factor in making a difference for students, regardless of their level of income. We must control what we can, and not make excuses for the things we cannot control. Those who bewail the state of U.S. education are singing the song they've sung for decades: They all purport to be for good education, but none of them are willing to pay for it. They search continually for the "Easy" button that will give them good results for no money, and label as subversive anyone who points out that the "Easy" button just doesn't exist. Want to know why our politicians think this way? Thanks Diane for your questions. To understand why this is so and how we might better engage the public in figuring out how to preserve public schools and why we most definitely need to do so, read "Preserving the Public in Public Schools" by Phil Boyle and Del Burns. My name is Jim Keelty and I am a physics teacher at Tappan Zee HS in Orangeburg NY. I received my undergrad at Manhattan College in Electrical Engineering. I loved your article and would love to implement more High end, in-depth, problem solving lab work in my course. I have always been a "tinkerer" and have built boat motors, decks, kitchens and a total car rebuild or two. Your plan will never happen in NYS. If, as you state in your article “the quality of current laboratory experiences is poor.” IT IS ONLY GOING TO GET WORSE BECAUSE OF GOV. CUOMO AND OTHER POLITICIANS. If, in order to keep my job, I must make my students pass their exam, do you think I am going to continue my labs where we build speakers, motors, lasers that carry music from their ipod on a light beam and then play it when the bean hits a photoelectric cell connected to a speaker? Hell no, I'm going to be giving them book work and drilling them on multiple choice questions. Because politicians feel they are better suited to dictate education than the educators who have been certified by these politicians standards, I will be producing robots, repeaters, students that will do well on their assessments but are poor problem solvers, non-critical thinkers. I have always been proud of the students I have produced. Better problem solvers. Proud that I always challenge them with tough, conceptual problems to solve. Sometimes it takes 60-80 minutes of class time for them to figure out how to apply what we learned in class to the problem but it is worth it. America needs problem solvers. Because this is hard some students fail. Maybe they just don't have what it takes. Maybe they just didn't put in the effort. For those kids, failing may be the best lesson I teach them. They learn, maybe for the first time, that if they don't work hard for it, they won't pass. Better find this out with me in high school than in college where it's going to cost mom and pop thirty grand! If this is the way public schools are going than maybe it isn't for me any more. I hope not because I really love what I do now. ps: Looking for any physics teachers at Cornell? One of the factors that needs consideration is that everybody has been in a school and in a classroom, hence they "know" all about a school. Few have had the responsibility to teach with all the work that means. Consequently, the average person has an unwarranted belief that they have a degree of expertise about schools and education. They also believe that teachers don't have to work as hard as they do for they have only an 8 to 3 day and get off for a 3 month paid vacation every year. Those of us that have been teachers know that this is sheer unadulterated nonsense, but it is none the less a widespread perception. Will those that attack the unions never learn that teachers, like all people, have a legitimate vested self-interest in guarantees of income and stability for their work. None on the critics seem to believe that teachers understand anything about their subjects and how to teach that subject. There is a tendency to act as if teachers are stupid (and sometimes individual teachers and the educational bureaucracy do a good job of being stupid thus making us look foolish). We as teachers must continue to strive to teach each and all the students from where they are and to raise their knowledge as far a possible. We must also push back vigorously against the ignorance of the political types that seek to "reform" education, a system that they do not really understand. I believe that a major part of the problem is that everybody has been a student in various classrooms and schools. They generalize and believe that they understand schools and teaching. Therefore, they have ideas based on ideology and a very imperfect understanding of schools that they wish to impose on the public schools. They are not interested in input from teachers for they are considered selfserving and really incompetent. We who believe in public schools must do a better job of supporting the concept and practice of public education. For at least 60 years I have been reading selfserving attacks on the public schools. How many of those who attack the public schools have another concealed agenda?